This easy recipe for Croatian palačinke (pah-lah-CHEEN-keh) or savory crepes calls for club soda in the batter and are fried in butter and oil. Try these savory crepes stuffed with meat or vegetables. To make a sweet version for dessert, add 3 tablespoons sugar and 1 teaspoon vanilla to the batter. Every Eastern European country has its version of pancakes or crepes. 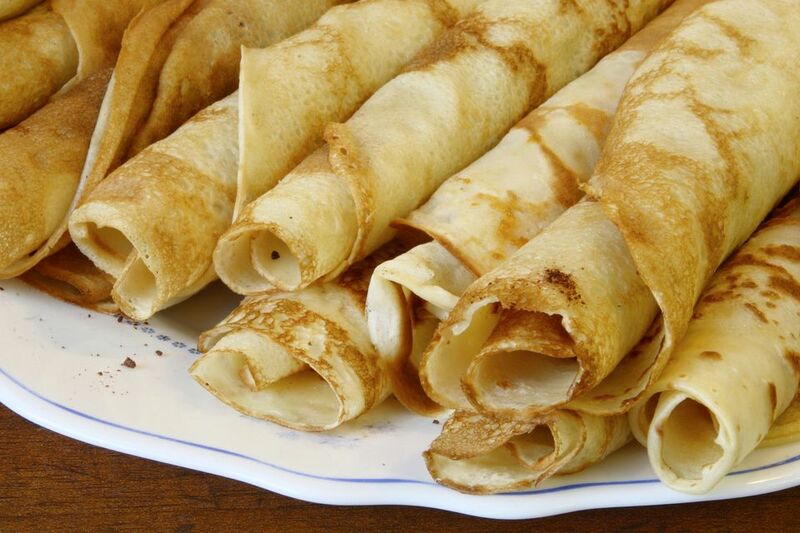 such as Serbian palacinke, Polish naleśniki,​ and Hungarian palacsinta. Lithuanians call these pancakes naliesnikai, Ukrainians call them nalysnyky, and in Romanian, it's clatita. There is little difference in the basic recipe except for the addition of melted butter or oil in some countries. In a medium bowl, beat together the eggs and milk until well combined. Mix in the club soda. Add the flour and salt, stirring with a whisk until only a few lumps of flour remain. Cover with plastic wrap and let sit at room temperature for 30 minutes. As the flour is absorbed by the wet ingredients, the batter will smooth out. When ready to fry the palačinke, stir the batter until it is completely smooth to prepare for making the crepes. Heat an 8-inch nonstick crepe pan or skillet. Add 1 teaspoon butter and 1 teaspoon oil. Then add about 1/4 cup of batter to the pan, tilting and swirling so it covers all or most of the pan. Fry about 2 to 3 minutes or until bottom is lightly browned. Flip over and brown the second side. Remove to a platter. Continue in this manner, adding butter and oil as necessary (probably every third crepe), and stacking crepes one on top of another on the platter. Use the cooked crepes as your recipe instructs. Palačinke freeze well when placed between sheets of waxed or parchment paper. Remove just as many crepes as needed for a quick meal or dessert.